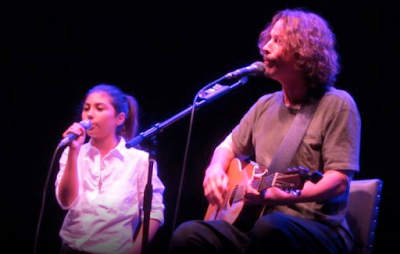 Chris Cornell was joined by his 11-year old daughter Toni for a cover of the Bob Marley classic, “Redemption Song”, at the Beacon Theatre in New York on Monday. On the road playing acoustic dates across North America in support of his fourth solo album, “Higher Truth”, Cornell welcomed his daughter to the stage. The follow-up to 2009’s “Scream”, “Higher Truth” was recorded earlier this year in Seattle with producer Brendan O’Brien. "We're already working on new material for an album," Cornell told Rolling Stone. "And then I've got several other irons in the fire and things going that I won't mention now. There's a lot of things coming in addition to ‘Higher Truth’, as well as a new Soundgarden album."